Surprise your youngest guests with a fun-filled activity that also awards them with a special gift to take home! 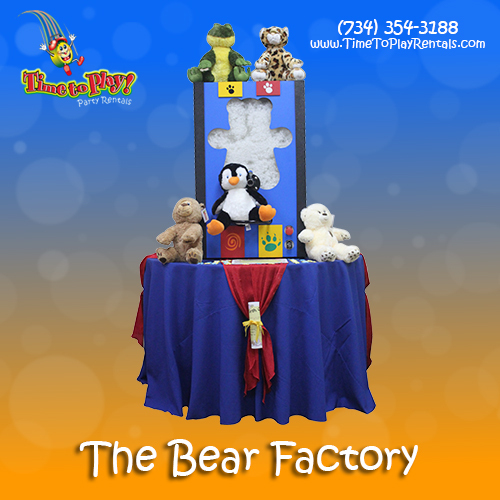 Our brightly-colored stuffing machines will delight the children at your party, as they watch the oh-so-soft stuffing circle around and fill their treasured animal. Our 16" Bear Factory animals have the most unique designs and the softest fabrics in the industry. Our machines are simple to use, allowing you to interact with your guests during this fun activity! Your rental includes our Stuffing Machine, Plush Animals, Fiber, Birth Certificates and Butterfly Inserts.